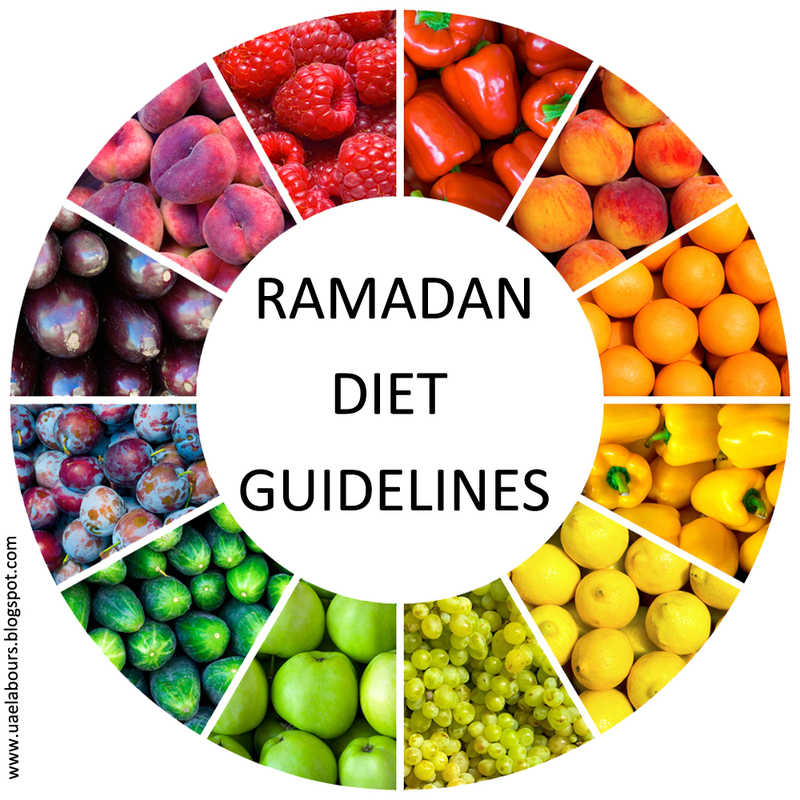 During the Holy Month of RAMADAN, people mostly kids, teens and young professionals face a lot of health related problems because of the sudden changes in their routine. Individuals suffer from problems such as low blood pressure, headache, constipation, gastritis and other general illness etc. therefore, it is always wise to keep a strict check on your food diet during the month of Ramadan. Some guidelines from UAE Labours Free Community Blog to our Readers are written below. 1. Consume Low digesting foods such as yams, wheat, oat, barley, lentil etc. 2. Eat fibrous food such as Fresh green vegetables, beetroot, Fresh fruit with skin etc. 3. Avoid fried and high cholesterol food such as sweets, Parathas, read kibbeh, samosa, spring rolls, fritters, pakodas, junk food etc. 4. Eat Normal, avoid overeating and Stop eating when you feel satisfied. 5. Consume almonds, bananas, dates, etc. 6. Increase water intake to stay hydrated during the hot day do not drink on empty stomach. 7. Avoid tea and coffee. 8. Do not eat Spicy foods as it can cause heartburn and gas. 9. Lentils, Beans, salad etc are recommended foods in Iftar. 10. Meat, chicken, fish should be part of a healthy Iftar meal but don’t overeat. Thank you For Your Time, do share with your mates. Aslamu alaikum .I am gini yusaf from Cochin( India). I am always crying now bcoz of my situation. I am worked 7 years in uae as heavy driver.my company and salary is good when I was in abudhabi.that time I have 4 credits cards and loan from Adcb bank. Unfortunately my 2014 my work contract is over,that time I have approximately 87000 dirham's want to pay tottaly. Thats difficult but I get some money from India and pay 75% money for all credits cards. But i cant pay balance money 25000 dirham's .then I come back in India. In 2015 and 2016 I try to get visit visa for dubai. Unfortunately my money lost for visit visa I can't get ,bcoz I knew I am blacklisted. Then I try to contact bank . now I get call from Indian banks .two banks are now put me on blacklist. I want to go dubai. How it is possible . I want clear this case. I really need work in Dubai . I hope your reply and god bless you. good day sir. i have absconding case in dubai and they give me lifetime ban. i just run away from my employer and they put me on a lifetime ban. is it possible to remove it. and ia it possible to visit dubai again just for vacation. my company has terminated me because of big accident was happen when i was working... is there any ban to me according to uae law? Hi good day im from philippines i come here in dubai last feb 13 as a tourist visa then someone told me i can give me a job but when i know is a helper i told to them i dnt like is not legel here a maid visa but they say if i want do go home to my country i need to pay them 9000dhms but i dnt have that so i go to my anty to tell my problem but i dnt come back to them that they i go then they that day they chnge my status visa as a employemnt visa with out mg knowlge and but abscoding have to sovle my problem that i dnt not they scam me. I came t UAE with three months tourist visa and on the last month I got employed by a wood work company, then I gave the employer my visa to change. He applied immediately, after two weeks he came back and told me that the immigration had a system failure that was why they couldn't approve my visa and they said he should apply again which he did,thank God they approved it. But to my surprise he came back after two weeks again and told me that the immigration said my visa has security problems that they cannot go on with the production. So I went on research to know the reason as to why the security problem, then I found out that my visa sponsor blacklisted me. Before then I have being in good terms with the man whom I know did the visa for me, I never knew that he gave money to a different agency who sponsored my visa. When I realized that,I went to the agency, paid the charge for the removal of the blacklist and I went to the CID and other places to clear myself. But the problem still continued then I went back to immigration to check what is now the actual problem, the immigration police nabbed me and threw me to jail. The immigration did not consider me because their system failure was the actual delay in the production of my visa before it got expired. Sir now that I am gone with retina scan due to my inability to pay my overstay, what do I do because I want to come back and my employer needs me till date he chats me on whasapp to know if I can come?. My name's Jean de Dieu Ndizeye, I would like to ask how to remove the overstay ban aftrr to be deported so that I can return back UAE! which I updated my passport too. Once updated again, I again applied for a visit visa to Dubai but the result was same. I also consulted well known agents regarding the same. After few days I got to know from a travel agent that if the visa is rejected many times then it is not possible to re-issue visa. Then he advised me to take help from Indian embassy. I worked in Dubai for almost 5years and didn't have any debt. All my records were clear. Past one and half years I'm staying at home whereas my family is in Dubai. I got many opportunities in Dubai, but couldn't achieve any due to this issue. Thus, my sincere request you to please help me out sort this security issue at the earliest. My name is Ajay Banga and i am from India. I got an job offer from one of reputed company of Sharjah for which company applied for my work permit but my visa got rejected with the reason of lifetime ban on my passport which was really very surprising. Actually I travelled to UAE only once on tourist visa which was also arranged by company for interview purpose. I arrived UAE on 24th Dec’16 (Evening) at Sharjah airport and departed on 26th Dec’16 (Morning) from Dubai Airport. I was there for approx 2 days only and I didn’t break any of UAE laws. Even in my home country (India) also I am not involved in any of legal/criminal activity, I was working in reputed MNC in India since 2005. Please help in solving this issue as from where i will get reason of this ban and how this can be lifted. Good day, I just want to ask some questions regarding for my problem.actually I'm on tourist visa and already overstay for 10 days.my travel agency is forcing me to exit or else they will file a case absconding against me.but I'm communicationg with them and asking for only a few days because I'm planning to go back to Philippines and I'm waiting for my fine.but still they don't understand and they told me that they will put a case against me.can you give me any idea how to solve it.I have relatives here in uae that could serve as assurance that I will not runaway.